Market leaders in the field of sheet metal processing are concentrated regionally in “Stamping Technology Valley” in and around Pforzheim. The last six editions of the Stanztec trade fair for stamping technology, which is held once every two years, have taken place at the Congress Centre Pforzheim (CCP). Everybody who’s anybody in the field of stamping technology will come together here once again from the 19th through the 21st of June, 2018. “The offerings must be brought to the market, and not the other way around” – a well-known saying of late trade fair promoter Paul E. Schall, founder of P.E. Schall GmbH & Co KG. The private trade fair promoters are still committed to this maxim today – with tremendous success. Stanztec has been growing for years, impeded only by available capacity at the CCP. Once again this year, a long waiting list confirms that interest remains unbroken in precision stampings made of steel, copper, brass, aluminium and other materials, as well as the associated production technology. And thus stampings can be found in all important every day objects: from automotive parts right on up to electronic components for medical technology and housings for consumer electronics. 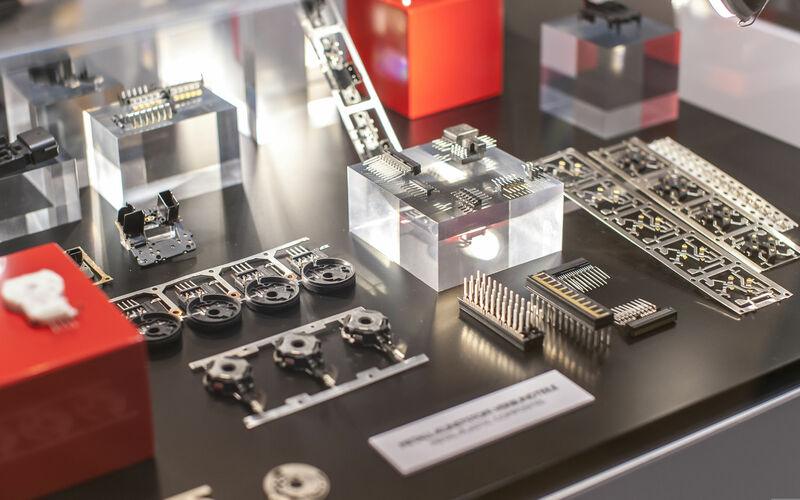 High-end stamping technology and stamped products, as presented at Stanztec, provide the basis for increasingly complex mechatronic and micro-system components, assemblies, subsystems and complete devices. For the simple reason that Stanztec’s tradition evolved within the triangle formed by the rivers Enz, Nagold and Würm, and because there’s hardly anyone who can match the companies headquartered in this region where precision and technology are concerned, more and more international expert visitors journey to northwest Baden-Württemberg. The number of interested parties who gather information once every two years at Stanztec regarding the latest developments in product and service offerings is rising continuously. “Visitor internationalism has increased as well in recent years. Visitors came from 23 countries at the last event including experts from Italy, Spain, Denmark, Sweden, Poland and Hungary. Roughly 150 exhibitors from five countries will present their offerings on 3500 square metres (37,000 sq. ft.), because the specialised industry meet is known for its high standards. You won’t find any manufacturers of cheap or mass-produced parts here. Instead, exhibiting companies are evolving into stamping technology all-rounders to an ever greater extent. Systems are offered for applications ranging from production planning right on up to precision finishing, high-end tooling for economical manufacturing of small quantities as well as quality-oriented mass production, and handling and feed devices for integrated further processing. Furthermore, the sixth Stanztec will not only present current technologies, processes, presses, tooling and stamping peripherals. Innovations will also be exhibited whose benefits will be revealed in tomorrow’s routine daily production. The latest developments provide answers to the big questions in sheet metal processing companies, for example with regard to functions integration, variant diversity and fluctuating production lot quantities. But market requirements for greater precision and improved quality have to be fulfilled as well. As is the case in many industry sectors, this also involves good quality management, automation and improved processing sequences. Schall trade fair promoters organises Stanztec in accordance with these market trends and their functional application in actual processing practice.